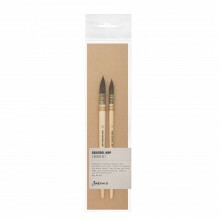 Jackson's Studio Synthetic watercolour brushes are made with the highest quality synthetic hair currently available, a silver ferrule and a simple but effective black polished handle. These brushes have a superb point, great colour holding capacity, and a lovely spring. Taken together, these qualities make for a top class watercolour brush. This is a Round brush, with a Size 3 brush-head. Please note, all Jackson's Studio Synthetic brushes are fully vegan. For more information and tutorial videos on Jackson's Studio Synthetic Watercolour Brushes, click here.